Speaking on the day the Prime Minister’s party releases its much-anticipated election platform. 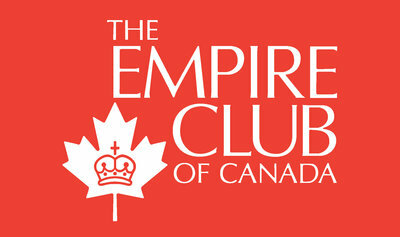 Reference to previous speeches at for Empire Club. Introduction to people attending with the speaker. The speaker’s party economic and fiscal plan to protect Canadians during a time of uncertainty. A response to some disappointments with regard to some campaign plans. Prudent leadership. A tested and true plan. A consistent course on economic and fiscal policy. What was said in the beginning and how that has carried through. Planning for the growth and prosperity of the Canadian economy, especially for working Canadian families. Keeping debt levels down. A recap of some of the speaker’s party’s actions over the past year. How the fundamentals of Canada’s economy are different from those of the U.S. , with some specifics. Making investments and creating jobs. The fundamental difference in approach from that of the Opposition parties, with specifics. Project announcements. Incentives to transform manufacturing sectors. Programs that leverage private-sector investment in strategic sectors, with examples. The intention to extend the super flow-through share provisions for the mining sector. Pursuing a global commerce strategy, with examples and specific initiatives. A review of the fiscal fundamentals underlying strategies. Comments on approaches by Opposition parties. Tax reductions, with details. The importance of these programs. Karen Stintz: Councillor, City of Toronto, Eglinton-Lawrence. And now, I would like to introduce today’s special guest. Today marks the fifth occasion that we’ve been honoured to have Stephen Harper speak here. The first time was back in January 2004, when he was an emerging presence on the political scene as the contender for the leadership of the newly united Conservative Party of Canada. The second time was in November of 2005, when, as Leader of the Conservative Party, he spoke of “Restoring Ethics and Accountability to Government” at the height of the federal sponsorship scandal. In April 2006, he joined us as Canada’s 22nd Prime Minister and again made the case for accountability in government—this time, his own government. Last November, the Prime Minister again took the stage to deliver an update from Ottawa and highlight his government’s Throne Speech. This time, Prime Minister Harper joins us on the day that his party releases its much-anticipated election platform and Canadians wait to hear how the federal leaders will respond to the turmoil in the global financial markets. Stephen Harper has been at the forefront of national debate at every stage of his political career, and there have been many stages. He has been a federal candidate, an MP for the Reform Party, Leader of the Canadian Alliance, Leader of the Opposition, Leader of the Conservative Party, and now Prime Minister. There was also a stint as the head of the National Citizens Coalition. An executive recruiter looking at his work history might conclude that this is a guy who likes to be in charge and who can’t hold down a job. But it’s not until you read Stephen Harper’s Facebook entry that you realize how truly eclectic he is. Many of us know he is a huge hockey fan, but it turns out he is also keen on curling. Perhaps the sequel to the book he is now writing on the early history of professional hockey will be followed by a book on his other favourite ice sport. We also learn that he’s an avid karaoke singer and an accomplished self-taught piano player, but by his own admission, politics has been the better career choice and Prime Minister Harper has certainly excelled in politics. No predictions will be offered here about what voters will decide on October 14, but if the past can offer a glimpse into the future, we know that it never pays to underestimate the formidable political force that is Stephen Harper. Ladies and gentlemen, please join me in welcoming to the podium today, the Right Honourable Stephen Harper, Prime Minister of Canada. Stephen Harper Thank you very much. Good afternoon ladies and gentlemen. Thank you Helen for that kind and wonderful introduction. I want to thank all the members, directors, and sponsors of the Canadian Club for having me here today and for having me in fact, as Helen mentioned, many times over the past few years. The Canadian and Empire clubs do a wonderful job of bringing important public issues into public debate and I really do appreciate the opportunity to be part of that. You have heard rumours of an election. I would just like to, if I could, draw attention to a few of my colleagues who are with me today. We have from York-Simcoe, our candidate and the House Leader for the government, Minister Peter Van Loan. From Simcoe-Grey, the Secretary of State for Foreign Affairs and International Trade and Sport, Helena Guergis. From Wellington-Halton Hills, Member of Parliament Michael Chong. From Eglinton-Lawrence, Joe Oliver. From Trinity-Spadina, Christine McGirr. From Brampton-West, Kyle Seeback. From Toronto-Danforth, Christina Perrault. And, of course, I would be very remiss if I did not mention the Member of Parliament from Whitby-Oshawa, the Minister of Finance, Jim Flaherty. Ladies and gentlemen, it is always a pleasure for me to be back in Toronto and I’m very pleased today to have the opportunity to speak to this joint gathering of the Canadian and Empire clubs, especially at a time when Canadians are deciding who will lead their government and manage the Canadian economy during the coming years. In the wake of recent global events, I want in particular to lay out our economic and fiscal plan to protect Canadians during a time of uncertainty. I do this knowing that there are some who are disappointed that for four weeks as an incumbent government we have campaigned on a plan to move forward in the same direction instead of shifting to head somewhere else. There is the view that unless a plan is brand new it’s not a plan, but the truth is the opposite. If you are making it up in response to the latest news or the latest change in the stock market, then it is obvious you really don’t have a plan. Prudent leadership does not set economic strategy for the nightly news or rewrite plans for the morning papers. On the contrary, as you know from your own business experience, the strengths of a plan are advanced preparation and consistent execution. You don’t shift long-term plans for short-term considerations. Shareholders like Canadians expect to see results not hear something new. In that spirit the plan that I lay before you today is tested and true. In fact we chartered a consistent course on economic and fiscal policy since the day we took office. We said from the beginning we would make affordable tax reductions, reduce the public debt, and keep spending under control and focused on results. This realistic plan of action for the Canadian economy is built on four principles—keeping our budget balanced, lowering taxes, keeping inflation down, and investing to ensure we continue to create the jobs of the future. And in three consecutive budgets that is precisely what we have done. This approach reflects our clear conviction as Conservatives that low taxes, less debt, and controlled and effective spending at the national level are a big part of the key to the long-term success of any economy. And that is our goal. Not jumping into the latest doomsday predictions, but planning for the growth and prosperity of the Canadian economy for the benefit of working Canadian families now and into the future. It also happens to be, if you think about it, how hard-working families and entrepreneurial businesses themselves plan for success—spending on priorities, keeping their debt levels down and making investments in the future for themselves and their children. When we say that the fundamentals of our economy are different from those of the U.S. economy, we are not referring only to some different economic statistics, we are referring also to the fact that we have identified and responded to these problems earlier and better than has the United States. For example, in the United States they entered this period already running enormous deficits and adding to their debt. Their fiscal stimulus package earlier this year added further to that debt and it was short-term in nature. In Canada we have kept our budget balanced and we have been paying down debt and last fall, months before Washington did anything, we responded with tax relief, $60 billion of broad-based tax relief, for consumers, families and businesses and we did it without going into deficit. Our tax action is long-term in nature, especially on the business side, and its fiscal stimulus was actually proportionately larger than the American package. In the United States they are still responding to the fallout of the sub-prime mortgage mess. In Canada we acted early over the past year. We acted earlier to further strengthen our banking disclosure transparency and regulations. We acted earlier to trim excesses in the mortgage market by reducing the 40-year mortgage to 35 years and requiring a minimum down payment of 5 per cent for new government-backed mortgages. And we acted earlier through legislation to give the Bank of Canada additional tools to respond to the credit and liquidity crises as it has done this week. And due to these actions we are not in a position of having to bale out our financial sector. So when some wonder in the wake of recent events why we haven’t thrown together a new plan, the reply of course is that the plan on which we have been acting is the plan. In fact the very reason we call it a plan is because action is planned before it is needed. As the saying goes, it wasn’t raining when Noah built the ark, which is why when the rain came Noah didn’t need to panic and he didn’t need to switch boats. Let me just talk about making investments and creating jobs. I mentioned that one of the principles of our plan is making investments to create the jobs of the future. This is a fundamental difference between our approach and that of the Opposition parties. The way the Opposition would cope with the challenges presented by the global economy is simply to throw money at it, to throw money at every problem, and to suggest that every problem demands an immediate response through short-term, high-cost intervention or subsidization. We didn’t do that for the past two and a half years and we are not about to do that now. Let me remind you about the kinds of investments we are making. Under our building Canada infrastructure plan, we are undertaking the largest investments in national infrastructure in this country in over half a century. Over the next seven years we are investing $33 billion. We have agreements signed with every province including gas-tax transfers to municipalities that we have made permanent. We have invested heavily in education and training including an increase of 40 per cent in transfers to the provinces for post-secondary education. We also introduced assistance to address skills shortages in the trades and tax relief for those who hire apprentices. We also announced our intention in this campaign to increase funding up to $50 million per year for programs directed specifically at supporting older workers who need help in transitioning in the work force. We are pursuing a new national science and technology strategy focused on successfully commercializing research and development, the area where Canada has fallen short in the past. In fact I will announce another specific large project in this area before the campaign is over. We are providing incentives to transform our manufacturing sectors. We are not trying to bale out failing companies. Instead, we have created time-limited tax incentives to stimulate the deployment of new machinery and equipment. Canada can maintain a competitive manufacturing sector, but to do so in the modern global economy we must move to a higher more capital-intensive end of the industry and that is what we are trying to help business achieve. I’m pleased to note today that our platform contains another measure along these lines. A re-elected Conservative government will enhance our support for the manufacturing sector by abolishing tariffs on a wide range of imported machinery and equipment. This will result in nearly $350 million in savings for Canadian manufacturers. Again this measure will encourage increased opportunity for manufacturing through investment in technology. We have also created dedicated programs that leverage private-sector investment in strategic sectors such as automobile and aerospace. Today, with the launch of our platform, I am announcing our intention to expand these programs by $200 million a year each in the auto and aerospace sectors over the next four years. Let me be clear. These will not be bale-outs of yesterday’s problems. We will support the development and deployment of new technology and these programs are designed to ensure that taxpayers’ funds are repaid. We’ve initiated the $1-billion community development trust fund targeted to rural Canada where single-industry towns have been hard-hit by problems in specific sectors such as forestry. Once again we are working with other levels of government to respond to infrastructure needs, worker retraining, and community development plans, not business bale-outs. I should mention along these lines an additional item from our Conservative platform that we are announcing today and that is our intention to extend once again the super flow-through share provisions for the mining sector. Finally we are pursing our global commerce strategy. Canada was one of the first countries to sign a modern bilateral trade deal. I’m referring of course to the one with the United States in 1988. Yet when this government came to office Canada had such deals with only five other countries in the entire world, perhaps one of the most pathetic records of any major trading nation. This government has already concluded negotiations on new deals with Peru, Columbia, Jordan and the four nations of the European Free Trade Association. We are also actively engaged in a number of other active discussions and negotiations. Let me just mention one interesting piece of news here. Early in our campaign I indicated our commitment to adopt certain recommendations from the Wilson Competition Panel, including opening up foreign ownership requirements in the airline and uranium sectors. This commitment is, of course, part of our platform. Should our government be re-elected, this commitment should enable Canada to rapidly complete negotiations with the European Union on an open skies agreement for the airline sector. Ladies and gentlemen, I hope this makes clear that we have and are pursuing a considered plan to invest in the future productivity, competitiveness, and job-creation capacity of the Canadian economy. Still I want to go back to the fiscal fundamentals that underline these—balanced budgets, lower taxes, and controlled spending. The platform we put out today has a fully implemented cost of less than $3 billion per year. That figure takes into account both our planned tax reductions and planned spending increases combined over and above things we were already doing. Ladies and gentlemen, the commitments in the platforms of the Opposition parties are at least 10 times larger than ours. Ten times. Numbers of that size, it is common sense, would mean raising taxes and running a deficit on a large-scale and overnight. That would be wrong for the Canadian economy, wrong now and with worse consequences in the future. In fact, the other parties are calling for increased taxes on both individuals and businesses including the imposition of a new carbon tax. To propose a massive increase in taxing and spending under today’s economic circumstances, to propose in particular that we hit the energy and commodity sectors hardest just when their market valuations are falling is not just wrong, it shows that the platforms of the Opposition parties are written for an economic fantasy land, a place where money grows on trees, debts don’t have to be paid back, and taxes are good for the economy. What the Opposition essentially proposes is to hammer any sector making money, subsidize any sector in difficulty, and throw away the solid fiscal credentials that Canada has built. This cannot be excused as proving they care or wanting to do more. When people are looking at their stock portfolios and seeing the drop, how can you tell them that your solution is to come in and hit their savings with harder taxes? It doesn’t make any sense. It is a recipe for disaster, nothing more nothing less, and that is not the direction this government is going to go. So let me be crystal clear. A Conservative government will not be raising taxes, we will not impose a carbon tax, we will not cancel planned tax reductions for business, we will not be running a deficit, we will keep our spending within our means; it is that simple. The alternative is not a plan. The alternative the Opposition is offering is just the consequence of complete panic and this government is not going to panic at a time of economic uncertainty. Now, ladies and gentlemen, let me just conclude by saying something briefly about our tax reductions. As I said earlier, this government has proposed broad-based tax relief and implemented it. Due to a host of income tax measures and cuts to the GST, the typical working family in Canada is saving more than $3,000 per year in federal taxes since we took office. That has been important in sustaining consumer confidence given some recent cost pressures. And, of course, it is also fair for hard-working, hard-pressed Canadian families. This government has also been pursuing aggressive tax reductions for business. In fact, by 2012, Canada will have the lowest regime of business taxation in the entire G-7. Our plan makes some additional commitments to both personal and business taxation, but the measure I want to specifically highlight is the tax-free savings account. Starting January 1, Canadians will be able to use the tax-free savings account, the biggest personal savings incentive since the creation of the RRSP more than 50 years ago. Canadians will be able to set aside savings that the government will never be able to tax again, because the money can be withdrawn at any time without penalty and without any loss to life-time savings. The savings and the earnings can be used flexibly to buy a new car, home renovations, a trip of a lifetime, anything else. Obviously, this is important for individuals and families. Think for a moment also about how important this is from a long-term macro-economic perspective, the creation of a powerful incentive to lead to a growing pool of national savings. Compare that with the situation south of the border with a credit market buckling under the weight of an overextended housing sector. All the incentive there has been to borrow against equity and real estate holdings leading to a housing market bubble that burst with nothing to fall back on except foreclosure and bankruptcy. By contrast, our tax-free savings accounts will create a new pool of investment capital that can be used to grow our economy and create new jobs. It will start small, just as the RRSPs did, but a generation from now I predict that this country will see the difference—much higher personal savings rates and much lower rates of government taxation on investments. Ladies and gentlemen, notwithstanding current market difficulties, I believe in Canada’s much bigger potential and I believe that if governments lift the tax load off Canadians, free them from the debt burden, and focus the spending of their tax dollars on things that actually make their lives and their economy better, then there truly is no limit to what our country can achieve. Canada has reached a fork in the road. That’s what this election is all about. As I have been cautioning for a long time, we are into a period of economic uncertainty and slower growth. It has happened before. The fork in the road is whether under these circumstances we will make choices that will worsen the problems for the sake of the short term or whether we will make choices that allow us to exploit our potential in the future. Some are suggesting we go back to the old ways. Their alternative to our plan is enormous spending leading to deficits, higher taxes that will kill jobs and investment, a carbon tax that will raise prices, various forms of bale-out and protectionism and a promise to spend 30 days developing an economic plan only after they get elected. That is not a credible plan. It is a menu of all the wrong ideas at the worst possible time. I don’t believe that’s what Canada needs and I don’t believe that’s what Canadians want, but if we do not win re-election that is what the next Parliament will do. And if we do not win re-election it will make Bob Rae’s Ontario look like a boom-town. On October 14, Canadians will choose between our real plan to protect the economy amid growing global uncertainty or the panic promises of an Opposition with no real plan and with policies that will take our country and our economy in the wrong direction. If we choose to stay the course with lower taxes, lower debt and prudent spending, Canada will come out of the current international downturn stronger, better, and more prosperous than ever before. Thank you again for your invitation and your attention. The appreciation of the meeting was expressed by Jo-Ann McArthur, President, Jo-Ann McArthur Strategies Inc., and President, The Empire Club of Canada.